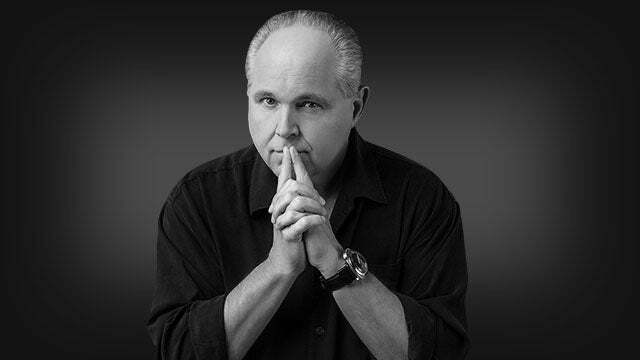 KING: I want you to listen here, ’cause my question is , “How does it play out for Republicans in the election year?” Uh, listen to Rush. 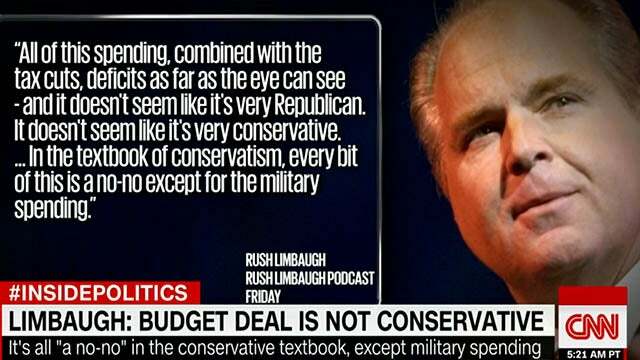 RUSH ARCHIVE: All of this spending, combined with the tax cuts, deficits as far as the eye can see — and it doesn’t seem like it’s very Republican. It doesn’t seem like it’s very conservative. … [I]n the textbook of conservatism, every bit of this is a no-no except for the military spending. HAM: There may be some. I doubt that they’re gonna be successful, because this is a party now headed by Donald Trump, who ran on loving debts and not touching entitlements. That is… That’s the new face of the party. So on these subjects, uh, frankly, I don’t think there’s much of a constituency for cutting stuff. If you have a big infrastructure bill (chuckles), DACA, welcome to a Democratic administration. RUSH: This is one of the… You know, the media is gloating. The Democrats are gloating. I saw a headline. I think it was the New York Times. I’m not sure. It was over the weekend, and it was somebody said, “Finally Obama got his stimulus, and it is the Republican budget.” I remember looking at that, and I could see how, you know, trying to lay claim… Because there are a lot of people claiming that this budget is a Democrat Santa Claus wish list, except for the military spending, that this budget blows to smithereens everything the conservatives have said they stand for. I saw another report saying, “So Long, Tea Party.” Where you been? The Tea Party was founded in 2010 in opposition to Obamacare, with a very high-ranking secondary reason being Obama’s limitless spending and the fear that it caused among people concerned about their kids and grandkids and their future. Okay. So that’s 2010 all the way through 2016. People are concerned about Obama. Now, Obama’s stimulus… Let’s be honest about it. Obama’s stimulus (we called it “the Porkulus”) in the first two months of his regime in 2009 is nothing compared to this. I am not talking about amounts of money. Because Obama’s stimulus literally did take money out of the private sector and then redistribute it back. There was no new money that went into the economy with Obama’s stimulus. Because he had to first take it out, or else print it. But with this budget, there is a very significant tax cut, and the budget analysts have reported with this budget a $1 trillion deficit, a trillion-dollar deficit. Not trillion-dollar increase in spending, but a trillion-dollar deficit. Now, part of that trillion dollars, again, is because of the way they score tax cuts. They look at tax cuts as a net revenue loss for the government, and that’s never correct. These tax cuts are going to be a net revenue gain for the government. They always are. Cutting the corporate tax from 35 to 21 is going to result in a huge amount of money flowing to Washington, not out. You wait. It’s gonna be much like the capital gains rate that was cut back with Bush in 2001, I think it was, 2002. And they were all expecting just dire consequences for the Treasury. And they could not believe! I mean the official budget people in Washington could not believe at all of the money, all the new tax revenue created by cutting the capital gains rate. And it was very easy to forecast, because what happened was that people began to sell appreciated stock and taking the profit. When they only had to pay 15¢ of every $1 in taxes, do it! But if you only get to keep, say, 55¢ or 60¢ of every $1, you hold it, or roll it over or you donate it charity or whatever. But you don’t sell it, nearly as much. But when you get to keep 85¢ of every $1, people start selling. So they started selling stock, taking their profits, paying the 15% tax, and money Washington never knew existed started flowing in. So I’m gonna predict right now that the budget deficit they tell us is gonna be $1 trillion is not gonna be $1 trillion. But there’s a larger question here. We have the Freedom Caucus in the House, Mark Meadows and Mo Brooks, a number of them, and they’re not happy with this at all. Mark Meadows on the budget deal: “The swamp won and the American taxpayer lost.” He was on Face the Nation yesterday. He said, “The real problem with this particular one is that our leadership caved. The swamp won and the American taxpayer lost.” “The House Freedom Caucus opposes the deal to raise spending caps on discretionary spending by nearly $300 billion over two years. We support funding for our military, but growing the size of government by 13% adds to the swamp instead of draining it. This is not what the American people sent us here to do,” said the Freedom Caucus in a statement. So when this budget was being debated… Let me just call upon you and your memory. I’m gonna ask Mr. Snerdley, because you may not know this, but Snerdley’s favorite subject is the budget. I mean, music, football? His favorite subject is the budget. Well, in politics his favorite subject is the budget. Will you tell me something? Where was the Tea Party? Where was…? Do not hear any criticism. I’m genuinely asking. During this budget, when it was being debated, where were all of the opponents to this? They were not very loud. (interruption) Well, the Freedom… (interruption) That’s what I’m saying. They tried. Forty people in the House… The Freedom Caucus is 40, 50 people, and they tried to be heard. But where were the voters? Two… (interruption) Wait a second. Wait a second. Now, in 2010 the Tea Party gets going, and it’s because of Obamacare primarily, and a facet of the Obamacare problem was the amount of spending. But that was really about something else, and that was about nationalizing one-sixth of the economy, nationalizing health care and putting Democrats in charge of it, that was profoundly opposed on that simple basis. Who are these Democrats? They can’t run anything right and now we’re gonna let ’em run health care? And then we had all the stories about death panels which turned out to be true. And we had lies about if you like the policy or doctor, you get to keep it. And there was just one lie after another from the Obama website to HealthCare.gov and how it didn’t work and so forth. And everybody’s fears about it were born out. Secondary aspect of it was the spending that people were scared to death of. 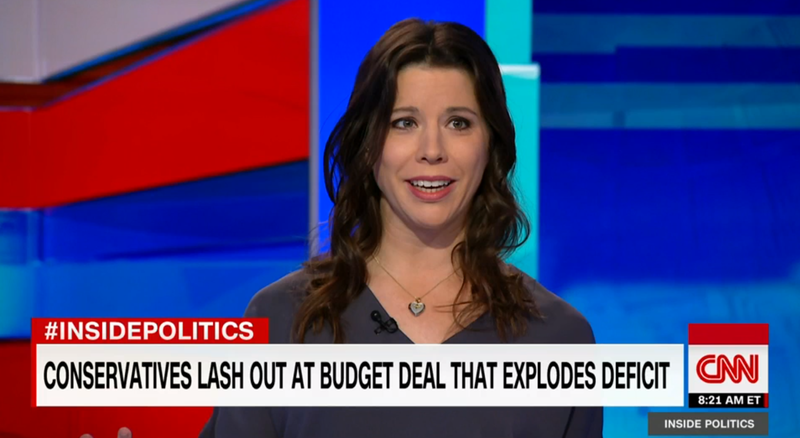 But there’s no question this budget, trillion-dollar deficit, let’s say it ends up being $800 billion, ’cause I think the tax cut is gonna produce revenue that nobody in Washington dares count on, and therefore they don’t see. But where was the opposition to this? And did Trump run on fiscal austerity? Did Trump run on cutting the budget? He ran on draining the swamp, but does draining the swamp mean taking money out of it? Or does draining the swamp mean getting rid of the swamp leftist liberal leadership, the career deep state types? What did it mean, “drain the swamp”? I think it meant get government out of people’s lives. Put different people in government that don’t want to be involved in everybody’s life. Get rid of the regulators, get rid of all the regulation, just get rid of the government getting in people’s way. Just get rid of a government that will not mind its own business, is what draining the swamp means. Some people think it meant money. But, folks, I need to share this with you again. My whole life, and yours, too, we have heard, my grandparents, particularly our grandparents — if your parents or grandparents, have to be your grandparents, lived through the Great Depression, that was the most formative event of their lives, then followed by World War II. But the Great Depression was a profound thing. Nobody had anything and the only way out was education. That was the fastest, easiest, most direct route to having a job and avoiding the pain. And so as such, people that lived through it preached to their kids and their grandkids the horrors of debt. For example, all my life, I grew up being told about the national debt monster. And then after a while, the annual budget deficit monster. And every year or every five years or however whatever it was, I kept hearing that someday if this isn’t stopped, there isn’t going to be any money. The government’s gonna have it all. There won’t be any to borrow in the private sector because the government’s gonna need all of it to service its debt. The national debt was gonna eliminate prosperity. The national debt was gonna destroy opportunity for prosperity. The national debt was gonna do all kinds of horrible things. And you add the annual budget deficit to it. The national debt’s just a cumulative total of all the budget deficits we’ve ever had, and none of that ever happened. And I was vigilant. I kept waiting for the country to end. I kept waiting for all of this disaster to happen. And it never did. And yet economists kept saying that it was going to happen. That the country is gonna go into default, the country will not be able to pay its bills, that’s gonna be the end of life as we know it in America when that happens. And now they’re saying it again. They’re saying that specifically, we’re gonna go into default. This trillion-dollar budget, we can’t — and yet none of these dire threats have materialized, while a bunch of things that don’t make sense have. Credit card debt, sky-high. Personal debt, sky-high. The number of people who can’t put together $800 for an emergency purchase is staggering, according to Census numbers and other surveys. The number of people living paycheck to paycheck shockingly, surprisingly high, we’re told. And yet look at our economy. It’s roaring, they tell us. New cars are being sold, new homes are being built and sold, existing homes are being sold. Jobs are being added. Wages are going up. Bonuses are being given. How does this make any sense, with what we’ve been told all of our lives? I’m asking. A good friend of mine, Professor Hazlett, I ask him about these things somewhat frequently and the answer is, “It’s gonna happen. It’s gonna happen. It can’t help but happen.” I said, “Yeah, except they have a printing press. How can they ever run out of money?” “Well, if they start doing that we’re gonna have massive inflation.” Well, but they did do that, and we didn’t get massive inflation. It’s called quantitative easing. They printed I don’t know how many trillions of dollars, it ended up in the stock market, to purchase securities, and all during that period of time interest rates didn’t budge. Now, there was inflation even though they weren’t talking about it, there was inflation. Things are more expensive today than they were eight years ago, obviously, but I wonder how many people have grown weary of the threats of eminent doom associated with all this? I don’t know — well, I gotta take a break, though, even if I’m on the sweet spot, I gotta take a break.